Canada’s Yukon Territory is huge, beautiful, and certainly not crowded. We love it! We are entering Whitehorse, the capital of Canada’s Yukon Territory. 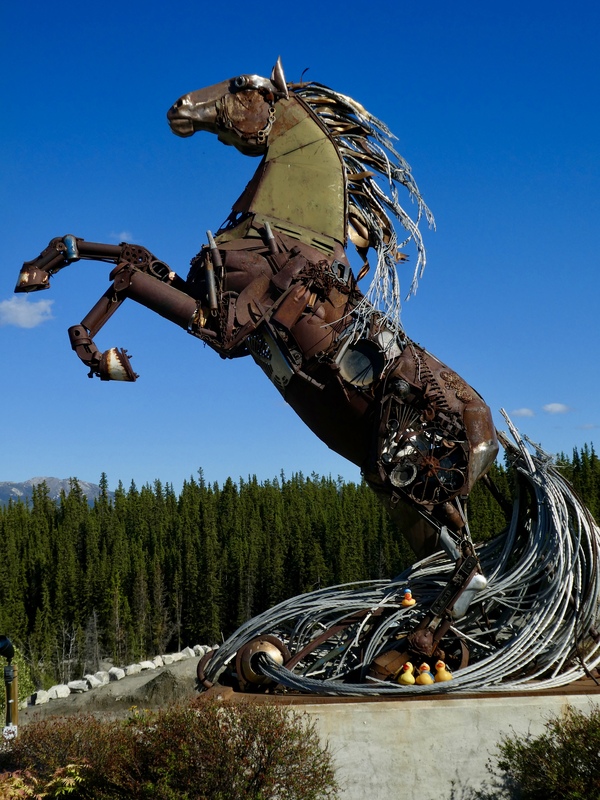 Look at this welcome horse, the Whitehorse Horse. What is this made from? What is the story behind this horse? Now you know. A contest winner and we have a great horse. This is near the Pubic Safety Building in Whitehorse. 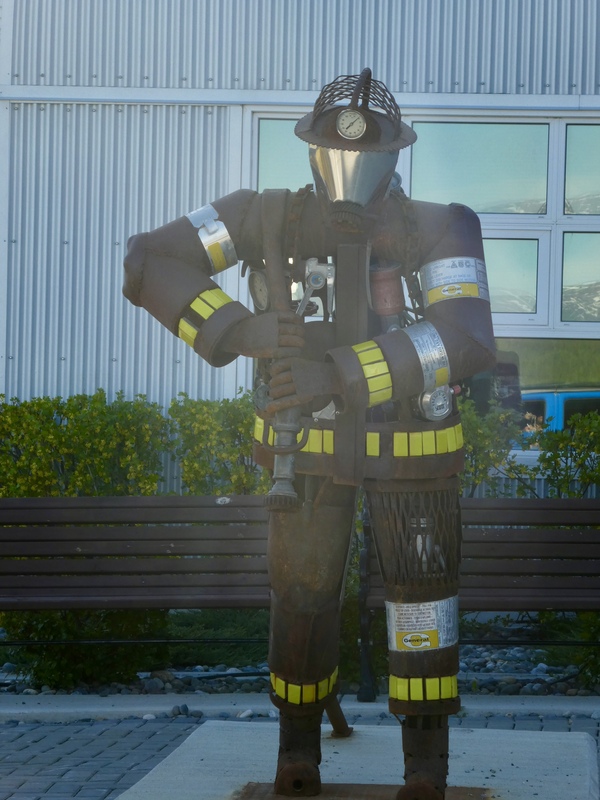 We like the fireman. Safety is important. We found a hotel right downtown, so we could walk to the Yukon River. Near our bench, we marveled at this giant totem pole. 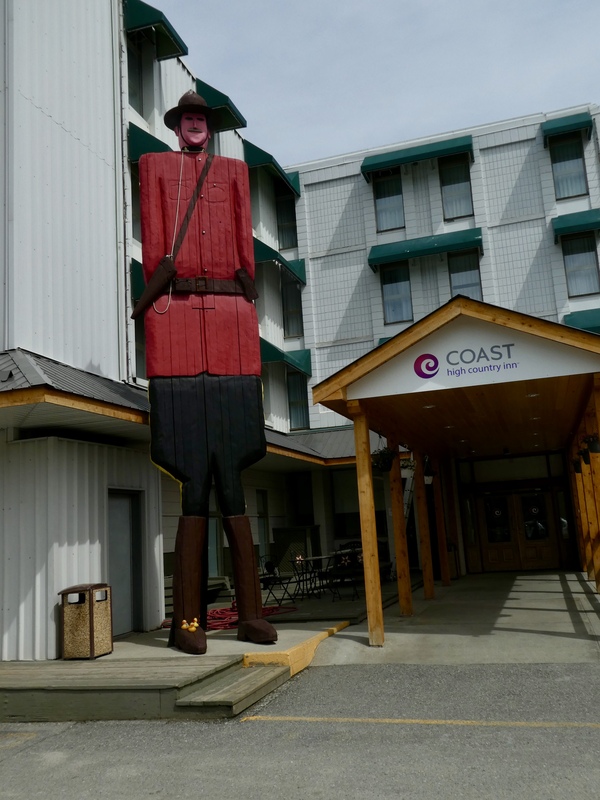 Walking a few blocks, we smiled at this taller than life Canadian Mounty. Could be a surprise if you stayed in a room on the third floor, looked out your window in the morning, and saw this Mounty’s head by your room. But we liked him. Carving wood must be popular here. 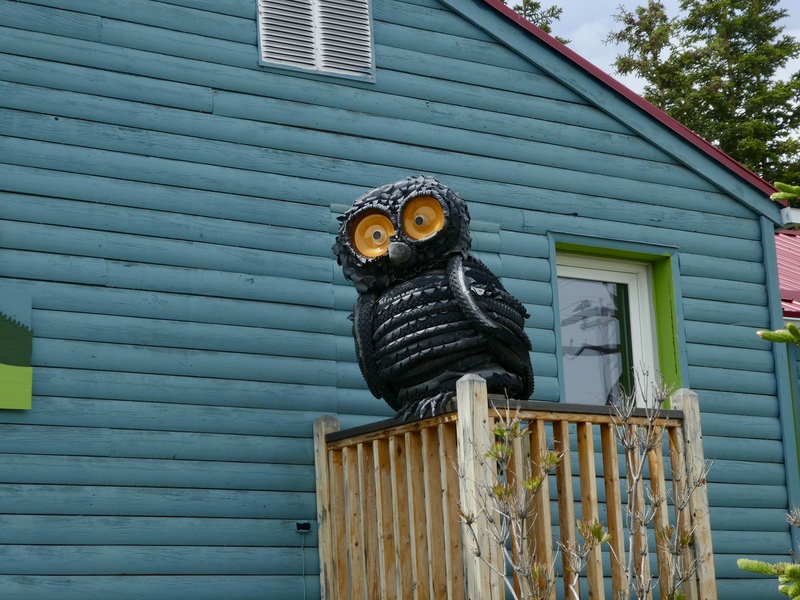 This owl is wonderful. Don’t you just love it? 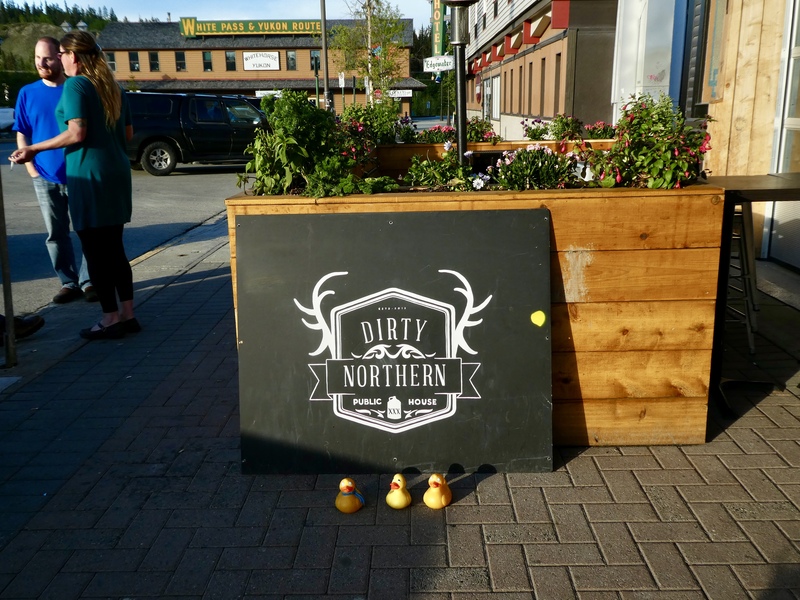 We heard this was a highly rated restaurant, so we tried Dirty Northern Public House. The decor was so northern woods, the service great, people were friendly and delicious food. We were so happy we ate here. Maybe you will try it also when you’re in Whitehorse. Walking back to our hotel, we could not miss this slab of native copper. This weighs 2,590 pounds, or 1,175 kilos. Slab of Native Copper. 2,590 pounds! 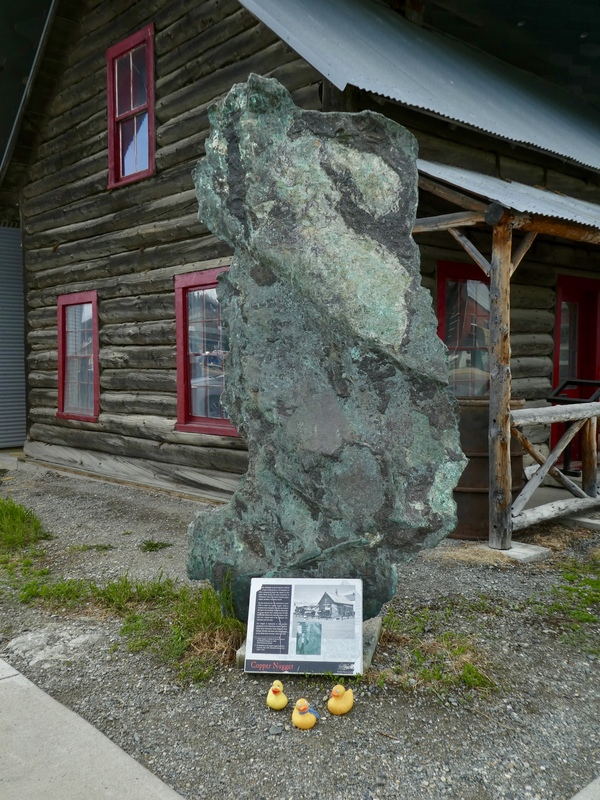 Discovered in 1905 in the upper White River, 250 miles NW of Whitehorse, this is the Yukon’s largest copper nugget. The sign says it is possibly a Canadian record for the largest copper nugget. 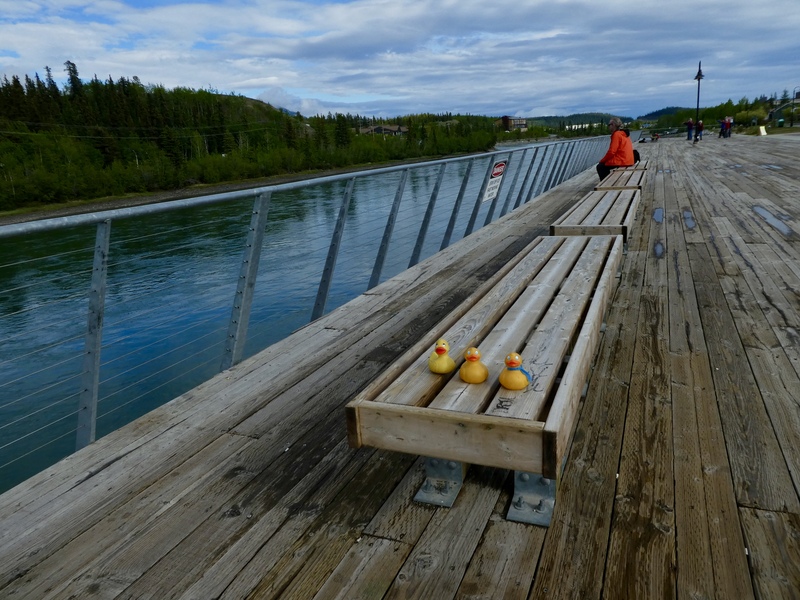 We, ducks and moms, liked Whitehorse and we all agreed that we wanted an extra day here to explore more. Guess we better tell our hotel we want to stay another night. Yes! We like Whitehorse. 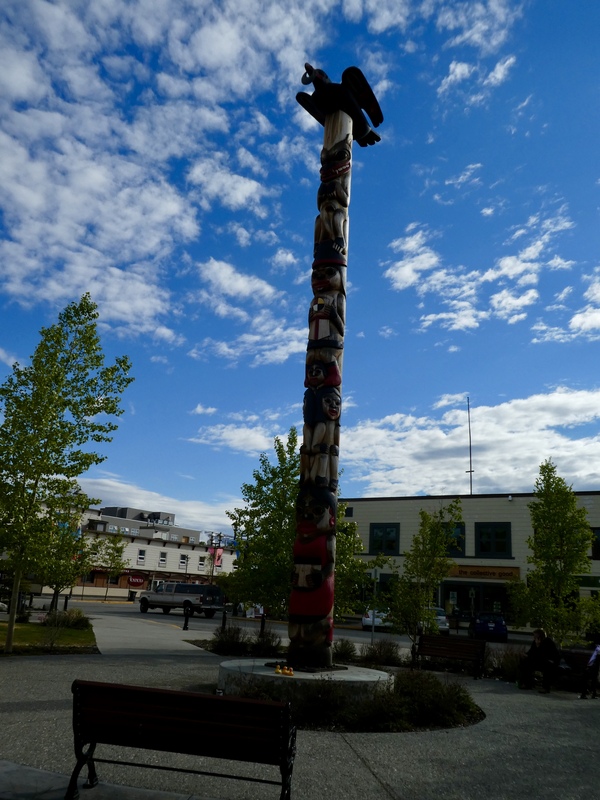 This entry was posted in Canada, Uncategorized, Yukon Territory and tagged Canada, Colorado Traveling Ducks, Dirty Northern Public House, large wooden Mounty, native copper, totem pole, Whitehorse, Whitehorse Horse, Yukon Territory. Bookmark the permalink. 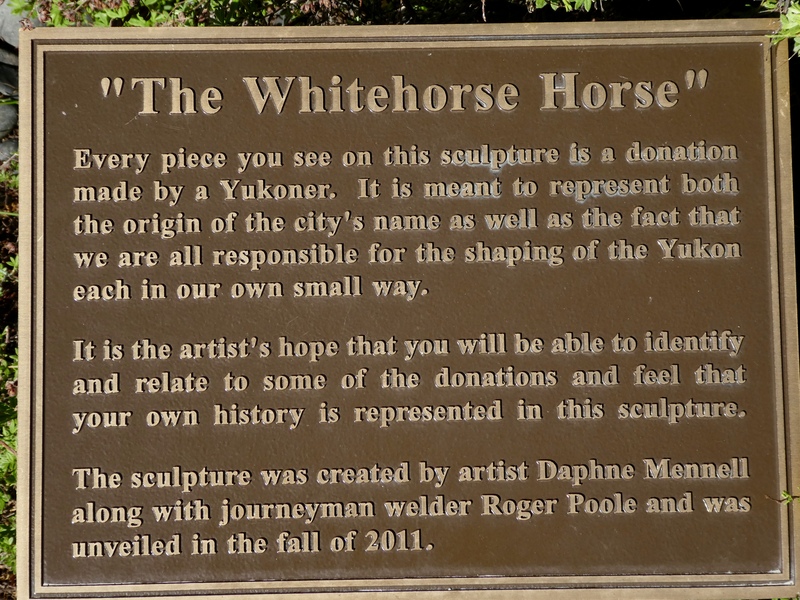 We love Whitehorse. And we always want more time in every location. Canada looks like such a beautiful place to go. I’ve always wanted to go visit Banff and the Canadian lakes…I’ve heard the water is a clear turquoise blue. We visited there many years ago and it is beautiful. We had hoped to see Banff and Lake Louise this trip, but it didn’t happen for us. Hope you get there soon. The water is beautiful. We always think at least a few days is necessary anywhere. It looks like you could spend much longer exploring in this area. I love those artworks. We loved the giant Mountie. That Whitehorse Horse is fascinating also. But, as always, never enough time.